The Texas Success Initiative, TSI, is a state law that requires all Texas public institutions to determine college readiness in reading, writing and mathematics for all degree-seeking undergraduates, including incoming freshman and transfer students, for both on-campus and online courses. TSI status does not affect your admission to the University of North Texas. The TSI Checklist is a three-step process at UNT. All incoming UNT students should use this checklist to navigate basic TSI requirements at UNT. Check your TSI status by logging into your MyUNT account. TSI status is located under the Student Center tab. Read more about important TSI instructions. TSI Complete = you have met all TSI requirements and do not need to take any further action. TSI Not Complete = you were unable to provide documentation for exemption or you attempted the TSI Assessment and did not meet the minimum score on one or more sections; mandatory advising will be required at your orientation meeting. Student's TSI Responsibility = you must take the TSI Assessment in the area(s) where your online account, myUNT, is showing "Not Complete." You must take the test before you may enroll in classes. If you are incomplete in any area(s), either provide proof of exemption from the TSI Assessment or take the assessment. If you are unable to provide proof of exemption from taking the TSI Assessment, you are required to sit for the assessment and provide the Learning Center with scores prior to registering. IMPORTANT: We may not have all of your transcripts on file – even if you sent them to the Admissions Office, so please send additional copies directly to the Learning Center. Students have the following opportunities to test prior to an orientation where registration will occur. All options require you to complete the Pre-Assessment Activity (PAA) prior to sitting for the Assessment. 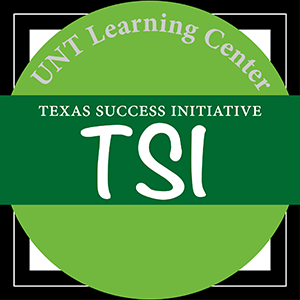 The TSI Assessment is offered by appointment at the UNT Gateway Testing Center. Appointments are available Tuesday-Saturday, and appointments are made on the Testing Center’s website. Please make sure you review all of their testing policy information. Students can test at their convenience closer to home if there is an open testing center nearby. Check with your local college/university for open testing options. For additional help, the National College Testing Association publishes helpful information for potential open testing centers. If the selected testing center requires one, complete the Remote Proctoring Request. Students must submit this information to the Learning Center no fewer than three days before the desired test date. You WILL NOT receive a voucher immediately. Please contact the Learning Center if you do not receive your voucher within three days and always check your email account's SPAM or junk folder. All students have the option to take the TSI Assessment via online virtual proctoring. Students using this function must complete a Remote Proctoring Request and have access to all of the following: high-speed internet, webcam, microphone, a distraction-free work space, and a willingness to grant virtual control of your computer to a certified proctor. Please note that you will not receive a voucher immediately. mailing copies via U.S. postage. If you do not meet the minimum standard listed below you will be required to participate in TSI advising session during your UNT orientation.